This guest post is by John Davenport of Phogropathy.com. It’s been said countless times in the blogging world that in order to be successful we need a plan. But how do we create this plan in a way that will help us reach our goals? Do we scratch it onto a piece of loose paper? Do we grab a crayon and write it on a napkin? Do we create a text doc on a PC and save it in some folder filled with hundreds files? No. We create a roadmap. When I first started blogging I had one goal in mind: to grow my audience. I was a nobody (and still I pretty much am a nobody) in this busy world of blogging, but I want to be a somebody, someday. So I created a roadmap to get there. You should too! What’s the problem we all face when we start out blogging? Too many great ideas at once. We’ve all been there, right? That first idea pops into your head, and then another, and then, oh my, you’re already thinking of redesigning the layout of our blog, but you also have that ebook you want to start, and you’re supposed to have a newsletter out at the end of the month! Your to-do list keeps growing and growing and there’s no end in sight. Every new blogger who does any amount of research on how to gain blogging knowledge has certainly found themselves here at ProBlogger; the problem is that it’s too good a resource! Every day there’s a new post telling us to do something with our blog. Maybe what to do if your niche blog fails to make money, or that you should have built a newsletter opt-in box before you published your first post. Regardless of what we’re learning, these posts always will generate new ideas for us to apply in our own blogs—I mean, that’s what they’re there for, right? When it comes to planning your blog’s future, we need to put all this information in an organized spreadsheet that we can glance at. This way, we’ll and know exactly what we need to get done in January and what will be done by October. Organization is probably the most vital skill in the blogging world. You might not have to have all your papers in line and all your photographs in perfectly named folders, but your plans should be organized. 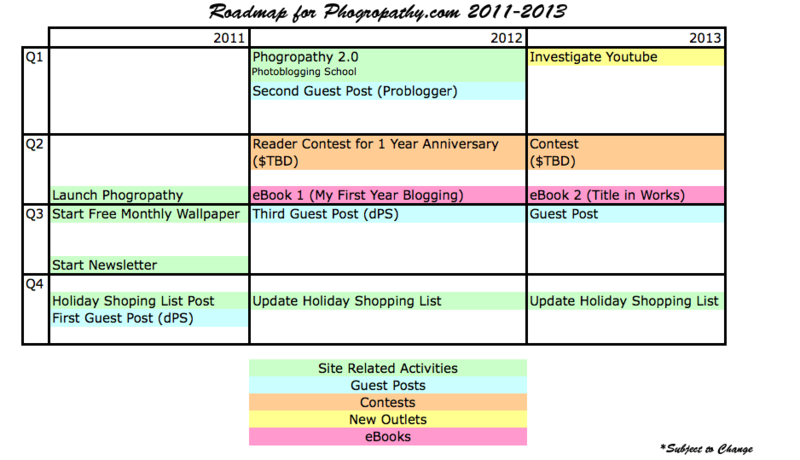 This is precisely where a blogging roadmap will come in handy. You might ask, “John why do I need a roadmap? Won’t a simple to-do list do the same thing?” Here’s my answer. Let’s break this down a bit further shall we? A list is a great way to start your roadmap, but ultimately you’ll want a plan that’s visual. When we have multiple projects spread across many months, if not years, a simple list can become an overwhelming thing to look at. At that scale, it’s definitely not informative. So, sure, a list can be a great starting point, but at some point it’s necessary to break that list into chunks—I broke mine up by yearly quarters—that reflect the things we want to accomplish in a given timetable. To give you an idea, here’s a screen shot of my 2011 – 2013 roadmap forPhogropathy.com. What you want to make sure you do when you create your roadmap is to spread things out. You don’t want to have a roadmap that ends next month: you’re building your blog for the future. So let’s make sure we plan things accordingly. Once your to-do list is in roadmap form, you’ll have a few years of targets planned. Now you’ll be able to visually see how all your blogging efforts fit together and ultimately, that will help lead you to successful growth. How? The clear-cut timetable gives you the ability to predict when you need to buckle down and get your work done on a specific project. For example, if you want an ebook ready to be published by Q3 of this year, you’d better start the final draft by the end of Q2, and the pre-marketing campaign sometime in early Q3. I made accountability an optional advantage in the list at the start of this discussion, and that’s mainly because some people like to be more secretive about their overall plans. But if you do choose to publish your roadmap, your readers will know exactly what you’re planning and when these things will take place. This means that you’ll be more likely to meet your deadlines, so that you keep your readers happy. But regardless of whether you share the information or not, with a roadmap, you’re always accountable to yourself. Planning ahead is key when you’re the only one driving your blog. You don’t want to get lost and you certainly don’t want to drive off a cliff. So make sure you create a blogging roadmap, and never leave home without it. Do you already work off a blogging roadmap? What’s your major goal for 2012? John Davenport is an avid amateur photographer and blogger. He shares daily photographs on his blog Phogropathy.com.